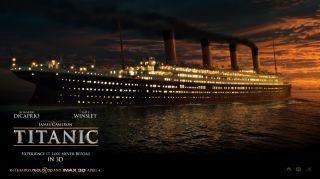 Speaking at the launch of Titanic on Blu-ray, James Cameron revealed that not even the world's most sophisticated computers could sink Titanic the way it sank back in April 1912. Despite finishing Titanic in 1997, the ship has been something of a labour of love for Cameron in recent years. He visited the Titanic's underwater grave for the 2003 documentary Ghosts of the Abyss and has spent the last few years painstakingly converting his movie Titanic into 3D at a cost of $18 million. During this time he has helped others understand precisely how the ship sank, more recently enlisting the US Naval Academy for its expertise. It was this enlisting, however, where Cameron realised that the way the Titanic sank could never be faithfully recreated by computers, because human intervention was the key to it staying afloat for so long. "Three years ago I commissioned a study with the US Naval Academy to create the most definitive model of the Titanic – an actual working diagnostic computer model of the ship," explained Cameron at the Titanic museum in Belfast where the Blu-ray launch took place. "So we took the plans that were provided to us by Harland and Wollf [the ship's builders] and turned them into a computer model and ran the most exhaustive flooding analysis of the ship." While this analysis effectively proved that all the eye-witness accounts of the Titanic sinking were correct – for example, the time it took for the ship to sink – one thing that couldn't be recreated was how it sunk, with the stern of the ship sinking slowly from a completely upright position. "You can see for other famous shipwrecks, including the Costa Concordia recently, they all tend to roll over. And our Titanic flooding model would roll 45 degrees in one direction or the other. "So we were forced to conclude something that was never known before, that it was human intervention by the engineering team below deck, all of whom died from the sinking, that kept that boat upright. "They were constantly moving water around, from fresh water to salt water tanks, running back and forward with the pumps so that the boats could have launched. "If it weren't for those below deck almost no one would have survived."